In Technical Tips #82 to #84, I detailed the process for installing Lithium Batteries in our coach. I wrote a blog update in March, 2015. I thought that it would be good to provide a further update and address some of the progress the RV industry is making in this area along with some future directions initiatives being taken within the RV industry. First-of-all, let’s debunk the safety issue. Lithium batteries used to power RV’s are not the same as the lithium-polymer batteries used in cell phones or other compact, high-tech products. Their chemistry is dramatically different as is their construction. The ones used to power RV’s are Lithium-Iron-Phosphate (LiFePO4). These are very stable and far safer than the lead-acid battery they replace. You can find out more with research, however the RV batteries have built-in charge control systems that prevent overcharging, which is the most likely way excess heat would be generated that could lead to failure. Many are fireproof by design and have fire retardant chemicals as an ingredient. Q: So, what have I learned? A: That I can forget worrying about 12-volt power! Initially, I was constantly monitoring the voltage and current draws, since with the AGM batteries I had become conditioned to doing this. As those batteries deteriorated, I doubled down on the discipline. It is hard to learn a new regimen. When I checked, the readings for the Lithium batteries (13.1-13.7 Volts) they were far above any that I had ever seen with the AGM’s. This created disbelief at first. As I grew accustomed to the new level, I wondered, when they were at 12.7-12.9 volts, whether they were discharged? 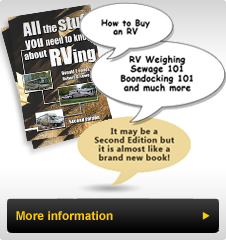 Slowly, I learned that there is no level likely to be experienced in typical RV usage, where there will be a concern about having sufficient power. Lithium batteries can safely withstand depletion of 80% of their rated capacity and once recharged, are just like new – no memory effect! Speaking of charging, did I mention that the Lithium battery charges in far less time than the original AGM batteries? (less than ½ in my experience) I notice on my dash voltmeter, after a night of dry camping, that the gauge settles down to normal readings in an hour after engine start up. Note that this could be after 3-4 hours of TV watching, using LED lighting at night, making coffee using the inverter powered coffee maker in the morning to percolate the coffee and after using a 120 VAC hair blower and a curling iron. We use the inverter to power a computer, printer and tablets along with various 12 Volt cell phone USB chargers and the modern-day paraphernalia associated with mobile travel. We do have a LP gas water heater, a LP/120VAC fridge which runs on LP gas when dry camping as well as two dual output LP gas furnaces. The dash gauge reading is never low, if we have been connected to shore power and then start out. One anomaly, which I had to find a work around for, was that the chassis battery was being charged from the Lithium battery all the time. Since the threshold for the charging system connecting the chassis battery to the ‘charger’ is 13.2 volts and the lithium battery is frequently above that level, the two battery systems are most often connected. The good news is that I always have ample power to start the engine; however I was concerned, especially when dry camping without shore power, about draining the coach battery as it ‘charged’ the chassis battery. When connected to shore power for longer periods of time, I was concerned that the AGM Chassis Batteries would be overcharged at 13.2-13.7 Volts. Professionals are divided on this issue, however I found the fuse that connects to the control coil of the ‘Big Boy’ charging relay. By removing the fuse, with one of our RVing FuseSwitches™, I stopped the charging. By monitoring the Chassis battery and reconnecting the systems when it drops to 12.5-12.6 Volts, I seem to have found a reasonable solution. Fortunately, on our coach, the remote Monitor panel in the Dump bay is powered by the same fuse, providing a ready reminder to reconnect prior to driving if I dump the tanks prior to travel. Where is the RV industry going with Lithium batteries? Interestingly, some Class B RV’s (such as the Roadtrek’s E-Trek) are equipped with them. Weight saving and removing the need for a separate generator drove that decision. What about the Class A & C coaches? Often innovation starts at the higher priced models and trickles down. Who would have thought, just a few years ago, that Bounder’s would have multiplex light control systems? Other mid-line coaches have adopted these electronic light and power control systems as well. Higher priced coaches have large energy needs, complex electrical energy management systems and an entrenched support system that will need to be re-engineered to include Lithium power. The RVIA, the industry’s regulating watchdog, has, as I write this Tech Tip featured webinars to bring knowledgeable professionals into discussions with industry engineers to work together on the transition. One upshot of the initial efforts is that the amp-hour capacity of these new systems is likely to be reduced to about 50% of that required with modern Lead-Acid batteries. What this means is that a Lithium battery of about 200Ah (Amp-hours) will provide approximately the usable power of a 400Ah AGM battery. Reduction of weight and space requirements are positive; recalibration of energy management systems will be needed. It is unlikely that Lithium Battery power will simply be an option, since there are too many changes required to optimize this power source. Coaches will need to be engineered for either Lead-Acid or Lithium power systems. When I purchased a 300Ah Lithium battery to replace the original 440Ah AGM’s, I thought I was making a sacrifice worthy of the risk. What I learned is that I have a power system that provides the equivalent power of a 600Ah AGM system. A 200Ah Lithium battery probably would have been sufficient. The reason is that AGM’s and other Lead-Acid batteries should not be discharged below 50% charge or their longevity will be severely affected. Furthermore, every charge-deplete cycle deteriorates a Lead-Acid battery, so that its life is reduced. Lithium batteries provide a near constant voltage until they ‘die’ and can safely be depleted to 20% of rated capacity with almost no effect on longevity. In towable RV’s especially, the batteries can be placed anywhere, such as under a seat or bed, since there is no routine maintenance and weight is significantly reduced. This power source will take time to be adopted because the industry from its inception has depended upon 12Volt power from Lead Acid batteries. Engineers will need to learn and adopt new protocols, develop and integrate new systems with component suppliers before Lithium Batteries will appear in RVs. Systems will need to be optimized to incorporate Lithium batteries. Service technicians will need to learn a lot, before these systems go mainstream. I can see the day when a standalone RV Generator will not be required on many RVs. Roadtrek uses an engine mounted extra alternator to charge its battery and it is more efficient than a generator. Imagine integrating air conditioning systems using a 12volt digitally controlled DC motor with an even more environmentally friendly and efficient cooling fluid, eliminating a redundant power source and individual A/C units, all powered by a never-to-be-changed Lithium battery for both chassis and coach needs. RVers will be the beneficiaries; they may also hinder this innovation if there is resistance to change. Think about how many TV’s we’d have if each had a Cathode Ray Tube (CRT). Look at the proliferation of LCD/LED TV’s in RVs today and where they are located. Initially there was resistance to change, then the demand for more. Now wireless TV can be in our hand or on our lap. Innovation using a Lithium power source, not a replacement of Lead-Acid batteries, will lead to incredible RVing experiences as we move forward. I am thrilled to no longer need to stress about our coach’s power source. How about you?